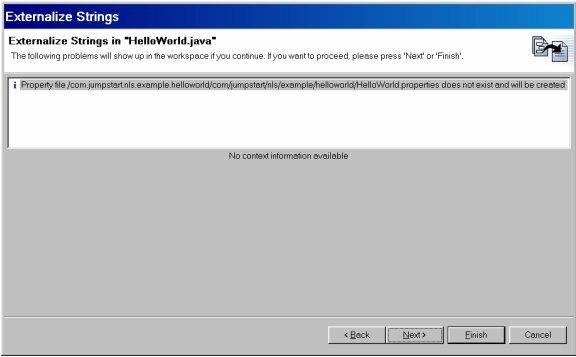 Editor's note: This article reflects Eclipse release 2.0. Resource bundles nicely handle language-dependent texts. The strategy is either to load all strings at once into a ResourceBundle subclass, or to retrieve them individually. 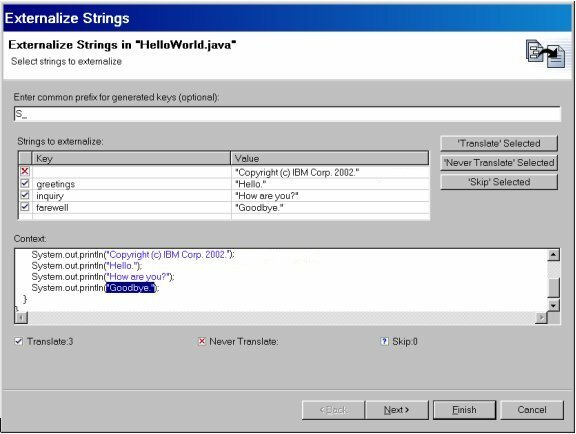 The Eclipse Java Development Tooling (JDT) in version 2.0 provides wizards to support the detection of translatable strings. We'll return to them shortly in Internationalization steps. Loading translated strings into memory is only the first step. The next step is to pass them to the appropriate controls for display (such as a label, text field, menu choice, etc.). The page designer and programmer must work together to assure that the chosen layout allows for appropriate resizing and reflowing of the dialog. The layout support in the Standard Widget Toolkit (SWT) library relies heavily on the programmer to "do the right thing" by specifying layout descriptions that react appropriately to changes in field sizes. The article Understanding Layout in SWT covers the implementation issues in detail. This is particularly important because text length increases during translation. English phrases are often shorter than their equivalent translations, usually on the order of 40%. Font sizes also may need to be modified to accommodate the local language. These forms of text content are more involved than simple key/value-oriented properties files, so the steps to their externalization are slightly more complex. Here we see a mix of translatable text, untranslatable text, and "gray area" translatable text, all as tag attributes. Clearly the id and class attributes are not translatable, since they represent programming identifiers. It is equally certain that the name attribute should be translated. You might be tempted to consider the version attribute (because of the locale-dependent decimal separator) or provider-name attribute (because of the locale-dependent legal attribution "Corporation") as candidates for translation, since they will be displayed to the end user. However, version numbers are generally left untranslated for two reasons: end users attribute little meaning to their numeric value, and programmers sometimes write code that expects version numbers to be a composed string like "3.5.4". It is arguably a better design decision that the version information be stored as separate numbers like major, minor, and service update to avoid the need to parse a version string, but that discussion is beyond the scope of this article. 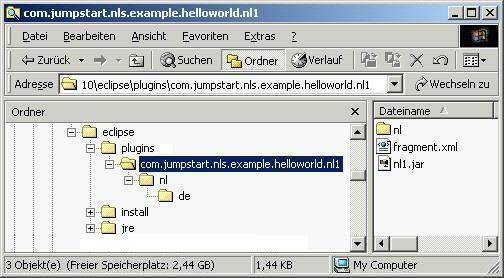 where plugin.properties contains the externalized string, "Jumpstart Example Plug-in" associated with the key plugin.name. This simple example demonstrates that translating isn't simply providing equivalent words or phrases for your text; it also involves an understanding of the local cultural considerations and potential legal impacts. This is why a translation professional is necessary, as well as translation verification testing. 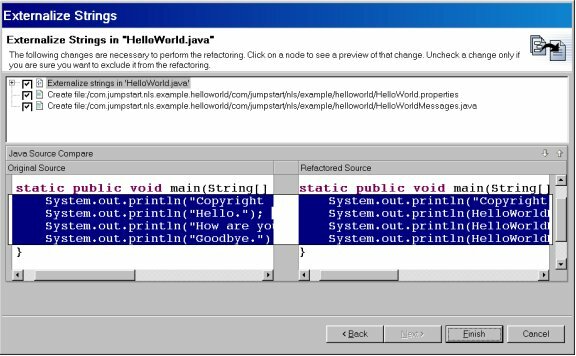 The Java library includes classes that handle the necessary formatting for numbers (decimal separator, thousands separator, grouping), dates (MDY, DMY, first day of work week), times (12- or 24-hour format, separator), and currencies (local symbol, shown as suffix or prefix, leading separator or none). These are more subtle and less common text translation concerns, but still noteworthy. Many applications simply allow free-format entry of phone numbers since there are so many local variations. Postal addresses are straightforward: Adding a "State/Province" field and allowing for multiple address lines is generally sufficient. Though less common in the United States, the proper enablement of honorifics (Mr., Mrs., Dr.) is considered absolutely necessary elsewhere to avoid a serious breach of etiquette. These are less frequently encountered. This involves substitution of measurement indications with corresponding conversion (for example, miles versus kilometers). In many cases, users will need either simultaneous display of a measure in different units, or an easy way of toggling between them. In general, products should select regionally neutral sounds, colors, graphics, and icons. The developer wanted to convey a metaphor for "IP router" by using a symbol harkening back to a national highway that traversed the United States from Chicago to Los Angeles, called Route 66. Most Americans would find this metaphor obtuse; imagine the confusion of the hapless non-US user. To avoid confusing and potentially offensive visuals, the best course is to engage professional graphic artists who are aware of cultural issues. 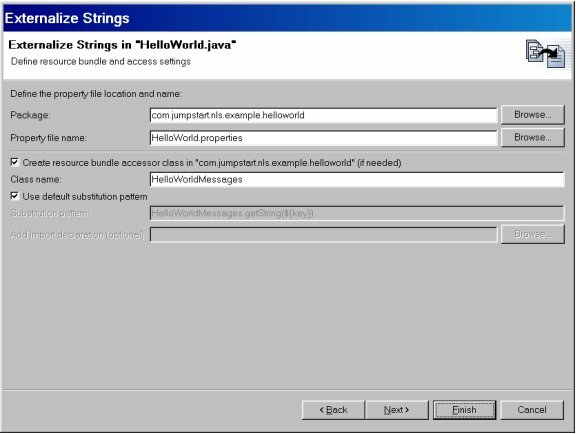 Fortunately, Eclipse's Java Development Tooling provides considerable help to properly separate translatable strings. The Source > Find Strings to Externalize menu choice displays the Externalize Strings wizard. This wizard will lead you through the steps to locate hardcoded strings in your code, classify them as translatable or not, then modify the code to use a resource bundle where appropriate. Hint: Clicking the icon in the first column of a given row will advance to the next choice: Translate, Never Translate, or Skip. Default fonts that are dependent on the language or operating system. A good default font for Latin-1 languages is an invalid choice for DBCS languages. Testing the readiness of a product for translation is non-trivial and beyond the scope of this article. 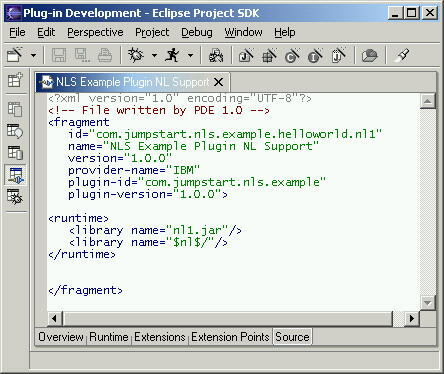 However, the follow-on article How to Test your Internationalized Eclipse Plug-in presents strategies for validating the NL-sensitive aspects of your product. type -- The default is '"code". 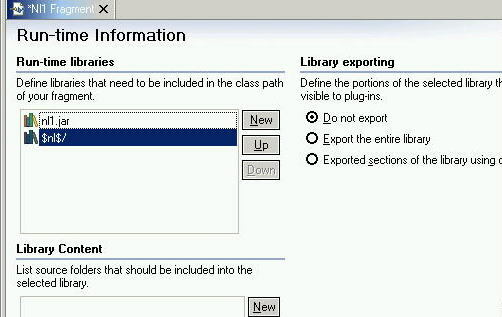 Specifying "resource" indicates the library includes resource files and no code. This improves overall performance significantly because resource-only libraries are skipped when loading code. The <runtime> section contains a definition of one or more libraries that make up the plug-in fragment runtime. The referenced libraries are used by the platform execution mechanisms where the plug-in loads, merges, and executes the correct code required by the plug-in. The name attribute accepts a library name ("nl1.jar" above) or directory containing resources. A directory reference must contain a trailing path separator. Optionally, the specification may include a substitution variable. In the example above, the second library includes a variable substitution $nl$ based on the locale; it is used above to add a language/region specific folder to the library search path (e.g., a locale of "it" = Italy, "fr" = France, or "de" = Germany, etc. would add the corresponding plug-in subdirectory it/, fr/, or de/ to the list of searched paths). 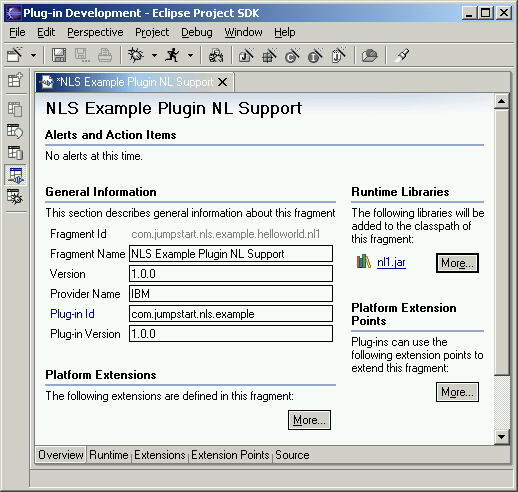 The value of the nl, os, ws, and arch substitutions variables can be displayed and modified on the Window > Preferences > Plug-in Development > Target Environment page. The nl substitution variable is used in those cases where it is not possible or practical to suffix files with the locale name. 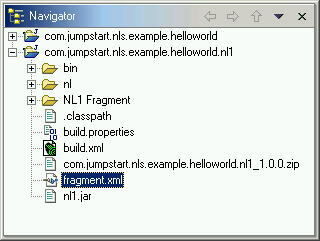 We specified the nl1.jar in the new fragment wizard so that library is already included in the classpath of this fragment. What is missing at this point is the inclusion of the locale-specific folder. You can add new runtime libraries by selecting More from the Runtime Libraries section of the Overview page, or by turning to the Runtime page, selecting New..., then entering $nl$/. The risk and consequences of performing an out-of-context translation, the results of which are sometimes quite amusing, are discussed in the follow-on article How To Test your Internationalized Eclipse Plug-in. Be aware that the translated properties files will very likely contain accented characters that are codepage dependent, so properties files must be converted to the ISO 8859-1 codepage expected by the PropertyResourceBundle class. The native2ascii utility will handle codepage conversions and insert any necessary Unicode escapes. There are no longer any accented characters, and the resulting string is composed entirely of characters having codepoints that are found in ISO 8859-1. But what are the \u00e8, \u00e9, \u00e0, and \u00f4 that were substituted? They are the Unicode codepoints of the accented characters in \udddd notation. Tip: If you are uncertain of the source codepage, you can spot-check the output of native2ascii against Unicode codepoints of common accented Latin characters table later in this article. If you find \udddd notations in your converted files that are not in this table (such as \u0205), it is likely that you specified the incorrect source encoding. There is no equivalent spotcheck for DBCS languages, where practically all the characters in the converted files are Unicode escapes. You simply have to be careful and validate against the running product. Testing the translation merits its own article. The follow-on article How to Test your Internationalized Eclipse Plug-in describes the process and lessons learned during the recent translation verification of the Eclipse Platform, and includes a view (an Eclipse plug-in, of course!) for performing a quick check of property file translations. Fragment sources, similar to plug-in sources, may be packaged in a JAR file. 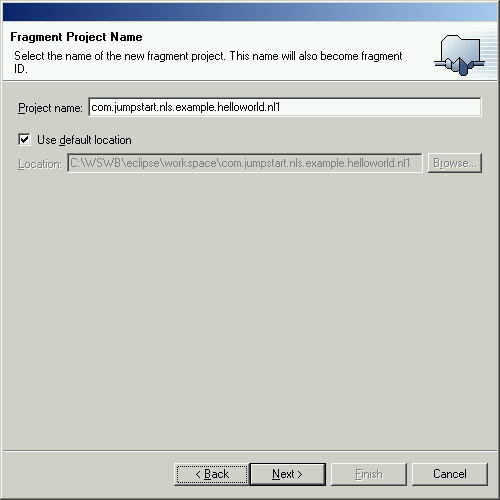 Using the PDE to generate the JAR package, select the "fragment.xml" file and choose "Create Fragment JARs..." from the pop-up menu. A wizard will guide you in creating a build script to produce all the required JARs for your fragment. If your fragment.xml file includes translatable strings, separate them into a plugin.properties file (just as you would for a plugin.xml file, i.e., there is no such thing as a "fragment.properties" file). 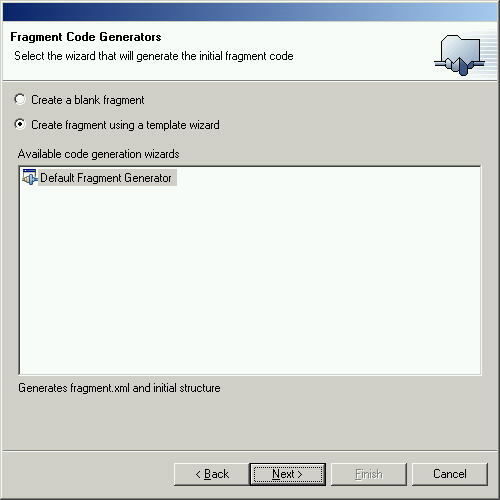 This works because fragments are an extension of a plug-in and therefore inherits it dependencies, including its plugin.properties file values. 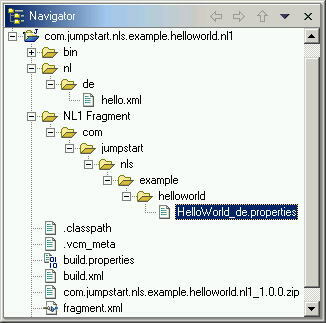 To deploy this example fragment, copy the fragment.xml, the \nl directory, and JAR to the com.jumpstart.example.helloworld.nl1 subdirectory in the plugins directory. This completes our example and the steps for internationalization. True or False: The majority of IBM's worldwide software sales revenue is within the United States. False. Indeed, more than 50% of IBM software revenue comes from outside the United States. Fortunately, those developers with products based on the Eclipse platform benefit from having ready translations of the base product. All that is left is to follow the clear steps outlined in this article to open your Eclipse-based product to a worldwide market! Characters can be represented by one or more bytes of information. Codepoints are the hexadecimal values assigned to each graphic character. A codepage is a specification of code points for each graphic character in a set, or in a collection of graphic character sets. Within a given codepage, a codepoint can have only one specific meaning. You can display the active codepage on the Windows® operating system with the CHCP command (only one codepage is active at any given moment). The codepage associated with a given piece of data. A file is said to be "encoded" in a given code page; for example, Notepad will encode its data in code page 437 on a US-English machine by default. The Save As dialog allows the user to select several other possible encodings, Unicode and UTF-8 most notable among them. Internationalization refers to the process of developing programs without prior knowledge of the language, cultural data, or character encoding schemes they are expected to handle. In system terms, it refers to the provision of interfaces that enable internationalized programs to change their behavior at run time for specific language operation. In a single-byte coded character set, a one-byte codepoint represents each character in the set. Typically, SBCS is used to represent the characters of the English language, the European languages, the Cyrillic languages, the Arabic language, and the Hebrew language, to name a few. In a double-byte coded character set (DBCS), a two-byte codepoint represents each character in the set. Languages that are ideographic in nature, such as Japanese, Chinese, and Korean, have more characters than can be represented internally by 256 code points and thus require double-byte coded character sets. Localization refers to the process of establishing information within a computer system specific to each supported language, cultural data, and coded character set combination. A mixed-byte coded character set is a set of characters containing both single-byte characters and double-byte characters. On the MBCS, each byte of data must be examined to see if it is the first byte of a double-byte or single-byte character. If the byte is in a certain range (greater than X'80', for example), then it is the first byte of a double-byte character. Directly from http://www.unicode.org: "Unicode provides a unique number for every character, no matter what the platform, no matter what the program, no matter what the language." Note: While it is true that Java text manipulation classes are Unicode-centric, this is often not the case for data stored outside of your program's auspices. Java programmers must take into consideration the data encoding by performing local codepage-to-Unicode transformations where necessary. Dan Kehn is a Senior Software Engineer at IBM in Research Triangle Park, North Carolina. His interests in object-oriented programming go back to 1985, long before it enjoyed the acceptance it has today. He has a broad range of software experience, having worked on development tools like VisualAge for Smalltalk, operating system performance and memory analysis, and user interface design. Dan worked as a consultant for object-oriented development projects throughout the U.S. as well as four years in Europe. His recent interests include object-oriented analysis/design, programming tools, and Web programming with the WebSphere Application Server. Last year he joined the Eclipse Jumpstart team, whose primary goal is to help ISVs to create commercial offerings based on the Eclipse Platform. In another life, Dan authored several articles about diverse Smalltalk topics like meta-programming, team development, and memory analysis. You can find them on Eye on SmallTalk. Scott Fairbrother works on the Eclipse Jumpstart team at IBM in Research Triangle Park, North Carolina. He is a software developer with over 20 years of experience. He has developed object-oriented application frameworks for business process management. He has written specifications for IBM middleware on Windows 2000 and has also authored on the subject of Microsoft Visual Studio .NET. Cam-Thu Le joined IBM in 1983. Cam's experience spans many aspects of software creation: development, testing, and National Language Support (NLS) planning and coordination. Cam has led the National Language versions of IBM products to worldwide concurrent general availability, including the 4690 Point of Sales product and VisualAge for Smalltalk. Cam joined the Eclipse Project last year as the NLS focal point. Cam coordinated the building and testing of the NL versions of the Eclipse Workbench and WebSphere Studio Workbench.